Observing the content of Ugetfix.com, it becomes obvious that this website focuses more on technical solutions and assistance. Here, you will find lots of posts related to specific errors. uGetFix.com is dedicated to help people solve various system errors or issues occurring on Windows and Mac OS systems. Besides that, the website provides valuable tips on how to maintain proper operation of your computer or a mobile device. uGetFix.com is dedicated to help people solve various system errors or issues occurring on Windows and Mac OS systems. Besides that, the website provides valuable tips on how to maintain proper operation of your computer or a mobile device. Observing the content of the web page, it becomes obvious that this website focuses more on technical solutions and assistance. Here, you will find lots of posts related to specific errors. When visiting, you can select one of options helping you navigate on UGetFix: you can either look for a solution by searching for its topic among the recent answers or type a keyword into the search bar located in the top right-corner. The section covers topics about recent trends in the cyber space. The topics range from discussions about a particular application or utility to a broader range of cyber safety-related issues. Fix encompasses hundreds of articles covering Windows updates, system or application-related issues. Here you will find such answers as how to solve the failed Windows update problem or how to fix a non-responsive taskbar. Additionally, this section covers topics related to malware. Some entries explain how to use a decrypter of a certain ransomware or how to tell a difference between a tech support scam and the original system error notification. This section of uGetFix provides insights about applications and presents uninstallation guidelines. Here you will find removal instructions for both, legitimate software and shady applications as well. Optimize section concentrates on helping users with certain system features. These articles encompass different functionalities, ranging from easy to highly problematic. Some tips will suggest how to improve the overall efficiency of a computer. Looking at the broader perspective, the website offers tech support assistance. To get the answer from the experienced team, type in your question into the given box. Speaking of technical specifications, the website uses a proper SSL certificate. Every article indicates the name of the author. Even though uGetFix.com provides online tech support services, you may not always get the response right after you post your question. However, each of answers provided by its tech experts is unique, so there is no surprise that they take some time to prepare the response. 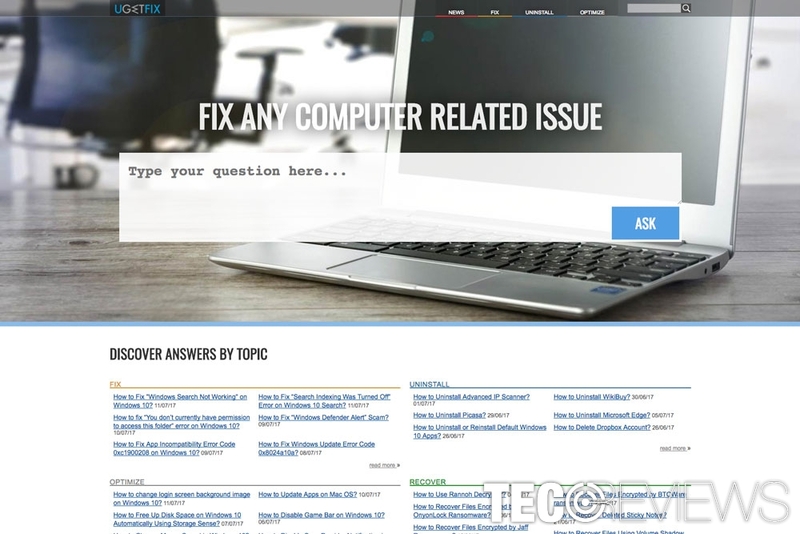 Besides, the website covers a wide range of topics, system failures, and other PC-related problems. Since all of them are different, its team could expand the list of offered digital app solutions. UGetFix.com was registered several years ago, so there is no surprise that it is still in an early stage of development. However, we expect that soon the domain will become a viral site with a long list of diverse topics and will appeal to a broad audience of netizens. It is one of the safest domains where you can find several solutions to your computer-related problems. ^ Homepage of Ugetfix. Ugetfix. Fix any computer related issue. ^ Linas Kiguolis. Busted: four suspects in the UK were arrested for devising Microsoft tech support scams. Tecoreviews. The Ultimate Destination for News and Reviews. ^ Ugetfix.com Review. Woorank. SEO audit tool and website review.